On July 10, the City of Chattanooga, Tennessee and green|spaces announced the winners of their Resource Rain Low Impact Development (LID) Design Challenge. With more than 200 people in attendance, teams of the area’s top landscape architects, engineers, planners, and designers gave quick, 7-minute presentations about their designs. 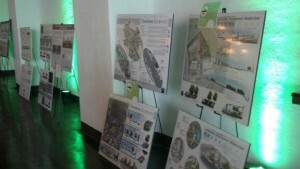 The teams worked for four months leading up to the awards ceremony to design green infrastructure practices on four possible sites. Winners received more than $55,000 in prize money. In addition to first, second, and third-place prizes, the public also helped to select a People’s Choice Award. The competition helped prepare participants and the community at large for the Tennessee Department of Environment & Conservation stormwater standards that will go into effect in December. Participants were specifically asked to use the City of Chattanooga’s stormwater management practices as a guide for their designs. 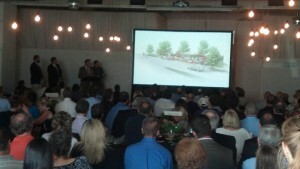 The first-place team for the Broad Street site included W.M. Whitaker & Associates Landscape Architects, GeoSyntec, and Garth Brown Designers. Arcadis won first in designing the Cherokee Boulevard site, and for the urban-commercial Northgate Mall site, the first-place team included DH&W Architects, March Adams, and Casey Neal Landscape Architects. Lastly, at Bonny Oaks, a multi-family development site, the team consisting of Ragan Smith, URS, Kennon, and Calhoun Workshop took first place. Read more about the competition and winners.